Biden's Son, Hunter, Discharged From Navy Over Failed Cocaine Test : The Two-Way Responding to a report from The Wall Street Journal, Hunter Biden said he was "embarrassed" that his actions led to his discharge. 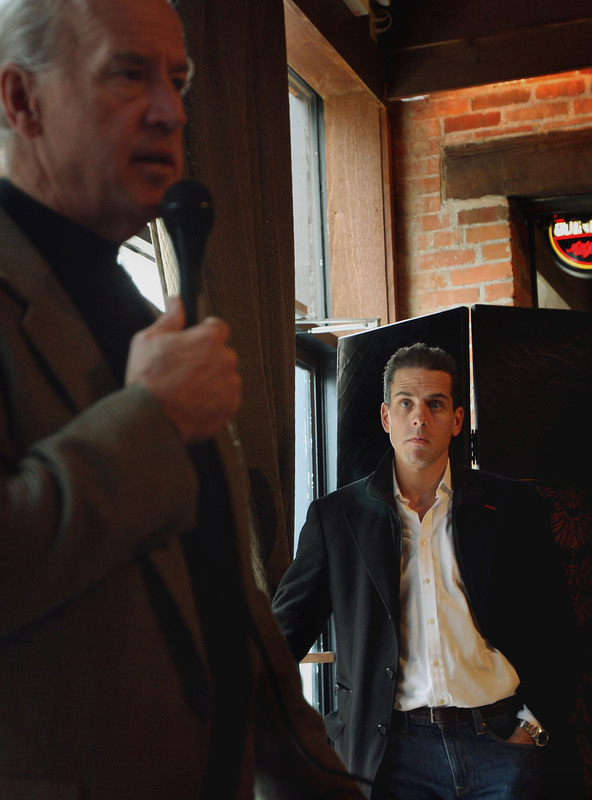 Joe Biden fields questions as his son Hunter Biden looks on at a campaign stop back in 2007 in Dubuque, Iowa. Vice President Joe Biden's son, Hunter, has been discharged from the Navy after testing positive for cocaine, a source familiar with the matter tells NPR's Tom Bowman. "Ensign Hunter Biden was selected for commission through the Direct Commission Officer Program in 2012. In May, 2013 he was assigned to the Navy Public Supports Element East in Norfolk, Virginia. He was discharged from the Navy Reserve in February, 2014. Like other junior officers, the details of Ensign Biden's discharge are not releasable under the Privacy Act." "Hunter Biden, a lawyer by training who is now a managing partner at an investment company, had been commissioned as an ensign in the Navy Reserve, a part-time position. But after failing a drug test last year, his brief military career ended. "Mr. Biden, 44 years old, decided to pursue military service relatively late, beginning the direct-commission process to become a public-affairs officer in the Navy Reserve in 2012. Because of his age — 43 when he was to be commissioned—he needed a waiver to join the Navy. He received a second Navy waiver because of a drug-related incident when he was a young man, according to people familiar with the matter. Military officials say such drug waivers aren't uncommon." In a statement issued by Hunter Biden in response to the Journal story, he says that serving in the Navy was the honor of his life. "I deeply regret and am embarrassed that my actions led to my administrative discharge," he said. "I respect the Navy's decision. With the love and support of my family, I'm moving forward."